Rory Loy's fourth goal this term gave Falkirk their first Championship win of the season as Hibernian were consigned to successive defeats. Loy showed great composure to back-heel the opener in the first half. An unmarked Paul Heffernan missed a glorious chance to level for Hibs, the striker heading wide from close range. Bairns goalkeeper Jamie MacDonald twice denied Farid El Alagui, who also fired into the side netting on a frustrating day for the hosts. Match ends, Hibernian 0, Falkirk 1. 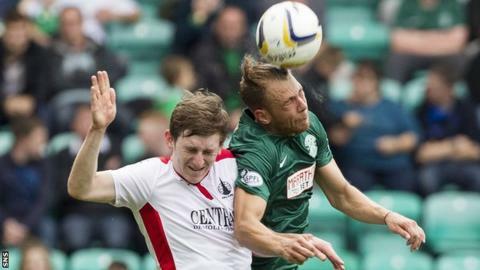 Second Half ends, Hibernian 0, Falkirk 1. Attempt missed. Jason Cummings (Hibernian) left footed shot from the right side of the box is too high. Attempt blocked. Liam Craig (Hibernian) left footed shot from outside the box is blocked. Substitution, Hibernian. Daniel Handling replaces Scott Allan. Attempt saved. Farid El Alagui (Hibernian) right footed shot from the left side of the box is saved in the top right corner. Matthew Kennedy (Hibernian) wins a free kick on the right wing. Callum Booth (Hibernian) wins a free kick in the attacking half. Substitution, Falkirk. Luke Leahy replaces Blair Alston. Alex Cooper (Falkirk) wins a free kick in the attacking half. Callum Booth (Hibernian) wins a free kick on the right wing. Attempt missed. Matthew Kennedy (Hibernian) right footed shot from outside the box is close, but misses to the left. Substitution, Hibernian. Samuel Stanton replaces Alex Harris. Corner, Falkirk. Conceded by Michael Nelson. Attempt blocked. Jason Cummings (Hibernian) right footed shot from the left side of the box is blocked. Attempt blocked. Michael Nelson (Hibernian) right footed shot from the centre of the box is blocked. Corner, Hibernian. Conceded by Tom Taiwo. Attempt missed. Jason Cummings (Hibernian) left footed shot from outside the box is close, but misses the top left corner from a direct free kick. Attempt missed. Blair Alston (Falkirk) left footed shot from the centre of the box is close, but misses to the left.